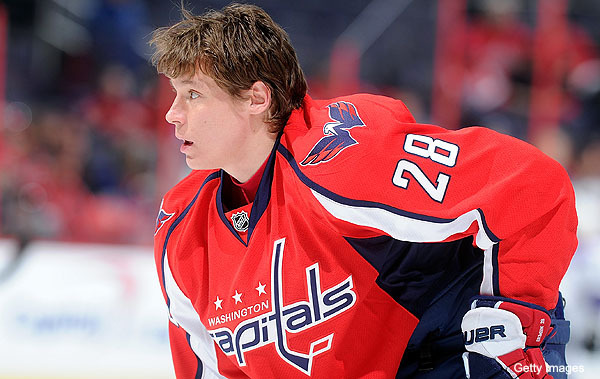 The Carolina Hurricanes announced they have signed star UFA forward Alexander Semin to a 1 year, $7M contract. He will wear the same #28 he wore with Washington with the Hurricanes. Alexander Semin may be one of the most offensively talented players in the entire league as he has scored 40 goals and produced 84 points in a season. Though his numbers have dipped over the past few seasons, Semin still has the potential to be a perennial 40+ goal scorer and 80+ point producer. He may have lost his focus while in Washington while fielding reports of issues dealing with his attitude and team commitment. Semin spoke on the deal saying, “I’m very happy to be a Carolina Hurricane. It’s a great fit for me. I look forward to playing with great players, and putting together a winning season. This signing comes to a surprise to much of the league. Never did Carolina cross anyone’s mind as a possible destination for Semin. It was expected Semin would settle with a big-market team. Semin only signed a one year deal so Carolina may just be a pit stop for him. He may try to use the potential success from this upcoming season to wager a long term deal with a big market team he’d like to settle with. Carolina could be a great fit for Semin. A move to a more southern market with less media with a less harsh hockey market could give Semin a new mindset and let him refocus on his game. On a line with brothers Jordan and Eric Staal, Semin is sure to rebound and put up big numbers this season. After a disappointing season that saw Carolina finish 12th in the Eastern Conference, management went right to work rebuilding the team. The rebuild actually started in the middle of the season when they fired head coach Paul Maurice, acquired defenseman Jaroslav Spacek, and extended Tuomo Ruutu. They made the biggest splash at this year’s NHL Draft by acquiring Jordan Staal from Pittsburgh for Brandon Sutter in a blockbuster deal. Management is showing they want to get to a competing level and win the Stanley Cup again. $7M for one season is a hefty price to pay for Semin’s services but will be well worth it if he can return to his old offensive form and Carolina makes a run at the Stanley Cup. On paper, these moves have made Carolina a hard team to play against. They are now a force to be wrecking with in not only the Southeast Division but the Eastern Conference. They are going to be led with the Staal brothers, Jussi Jokinen, and Jeff Skinner for forwards, defensemen Joni Pitkanen and Joe Corvo, and goaltender Cam Ward. Has Carolina’s rebuilding made them into a playoff contender? This entry was posted in News, Trades, & Signings and tagged Alexander Semin, Brandon Sutter, Cam Ward, Carolina Hurricanes, Eric Staal, Jaroslav Spacek, Jeff Skinner, Jim Rutherford, Joe Corvo, Joni Pitkanen, Jordan Staal, Jussi Jokinen, NHL, Paul Maurice, Stanley Cup, Tuomo Ruutu, Washington Capitals. Bookmark the permalink. Semin routinely wows teammates and opponents with his pure skill. He has one of the game’s best wrist shots, soft hands and elite stick skills that sometime leave him overconfident and lead to penalties. He scored 21 goals this season and had 33 assists. It was his second consecutive 54-point season. Three other times he’s topped 73 points. Semin has been known to sit with injuries some teammates feel he could play through – three times missing 19 games or more in a season. Yet he matched a career-high with 77 games played this season and still cut his penalty minutes from 71 to 56.